I love Fall because I know the holidays are around the corner and it’s a time for gathering family and friends. This Thanksgiving I wanted to create one of those Farmhouse Gather signs that you may have seen all over the Internet recently. I decided to create my own unique version, instead of using a stencil on an old board to stencil the word Gather, I salvaged a pallet board and used burlap fabric. 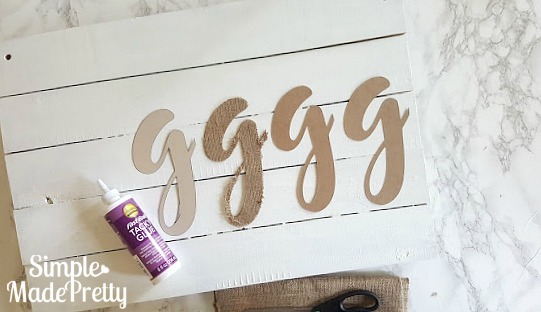 Learn how easy it is to make a unique DIY Farmhouse Sign with Burlap Fabric Letters in this tutorial and how-to video below! 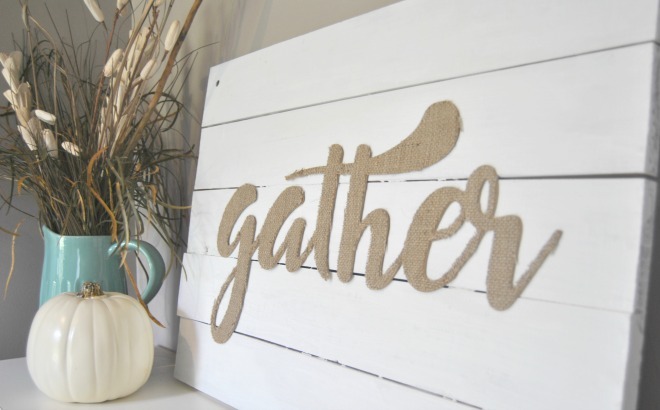 This 3-D “Gather” sign is perfect for Fall and Thanksgiving decor but also can be displayed year-round as farmhouse style decor. The fabric featured in this post is from www.burlapfabric.com. 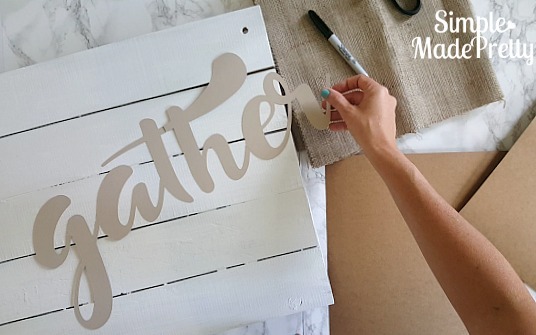 The first thing you need is to determine the type of wood backing to use for your sign. I used old wood pallet boards for mine because it was free. 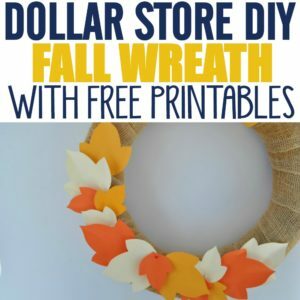 If you want to make a similar wood background as mine for your DIY farmhouse sign, see if your local garden center has any old wood pallets they would like to give you for free (it helps if you shop there regularly or offer to purchase something). 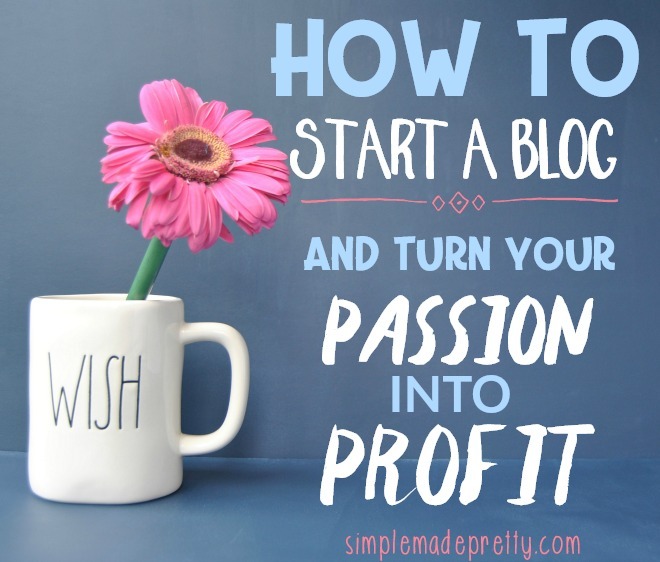 Take the pallet apart and cut wood planks to size (my sign measures 26″ x 18″). I laid the planks together to form a sign and used 2 planks and a nail gun to keep the boards together (see more instruction in the video below). The other option is to go to your local Home Depot or Lowes and ask them to cut a piece of wood (plywood should do) at 26″ x 18″ measurements. Paint in your color choice (I choose a bright white to make the burlap color pop). If you plan to hang the sign, you can drill holes at the top or nail wall hanging hooks to the back (I did both but used the hooks to hang it). 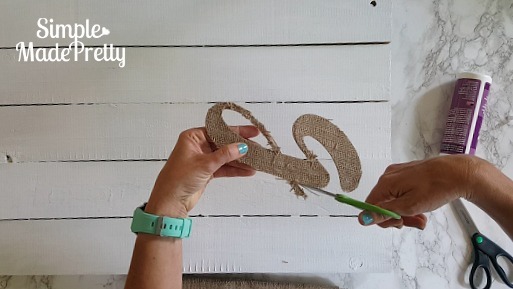 Once you have the wood ready, you can start making the Burlap Fabric Letters. 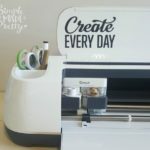 If you have a Cricut Explore Machine or Cricut Maker Machine, I’m including a link so you can make-it-now for the “Gather” letters but if you don’t have a Cricut, just print the free printable stencil and cut by hand (as shown in the video). 1. Gather supplies. I used burlap fabric, medium-weight chipboard, and a stencil. Watch the video below for more instructions! 3. Stencil each letter 3 times (each) on the chipboard then cut out each letter (you should have a total of 4 letters). 4. Stencil each letter over the burlap fabric. Make sure to iron your fabric to remove any creases. Be very careful cutting each letter. 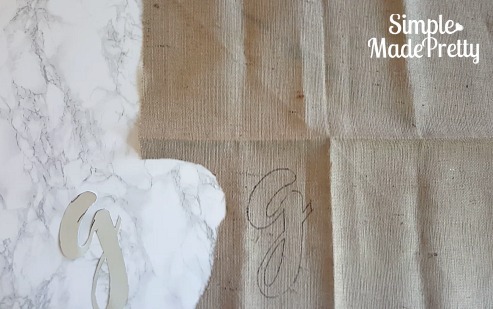 If the fabric rips or falls apart, make the cut wider or gently piece back together (see the video for more instruction). 5. Glue all the layers together so the burlap layer is on top and the cardstock stencil is on the bottom. 6. 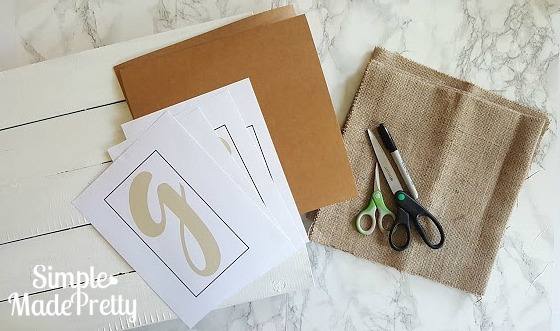 Give each burlap letter a “haircut” to remove any strands or rough edges. 7. Arrange the letters on the board so they connect then glue to the board. 8. 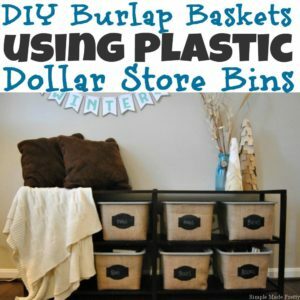 Add hooks to the back or drill holes in the top with string/rope if you plan to hang it. 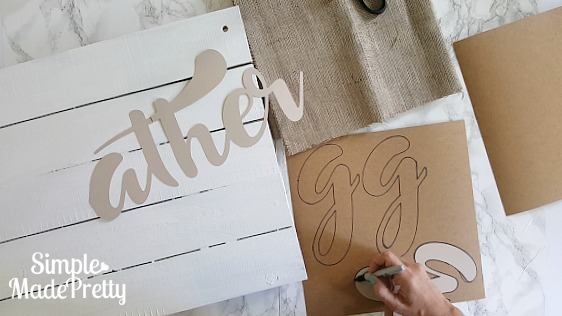 Watch the how-to video to make the Burlap Fabric Letters Farmhouse Sign! 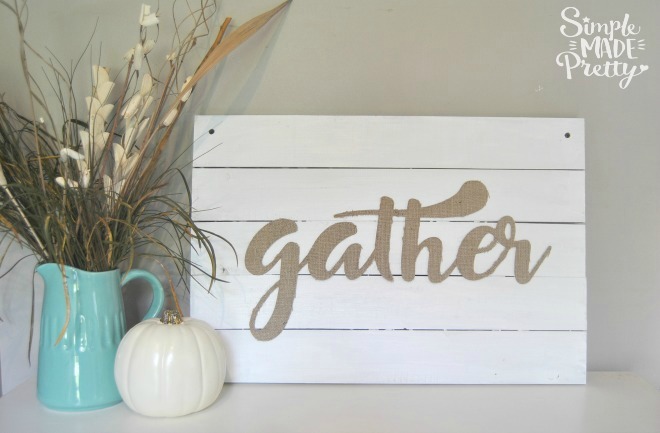 Grab the Free Printable Stencil to make the Gather sign!